When you read about an album (before you hear it) that the band in question has undergone "a change in direction" you immediately think of two things: 1. They've been told to do so, or 2. Spinal Tap's "jazz odyssey" change of direction mid-tour. Thankfully neither of those apply to Divine Comedy with their new release, their first for a major label following their defection from the former Irish indie loving Setanta label. For indeed they have changed, gone, as Neil Hannon puts it, is the "smart arse" touch that people associated with the band and in comes a distinctly darker, simpler, yet more ambitious tone. From the opening bars of the beautiful musically conscious "Timestretched" to the closing waves of the fashion conscious "The Beauty Regime" there's not an orchestra in sight, just superb songs from one of the finest songwriters this island has ever produced. Yep, that's ever produced. Produced with subdued grace by Radiohead producer Nigel Godrich, "Regeneration" is an invigorating, stirring and often sublime listen. It's key moment comes four songs in with the self conscious diary style "Note To Self" when Hannon, completely unexpectedly, screams "what the **** is happening?! Where's everybody gone? What the hell is going on?!" 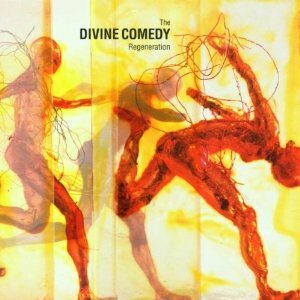 It's a perfect moment, and a wake up call for Divine Comedy 2001: he screams, the guitar kicks in and, not for the first time during the album's duration, the listener is reminded of Radiohead. That moment in "Creep" where Thom Yorke breaks down mid-song is an obvious comparison point and in theme "Note To Self" is similar albeit in execution, it's done in far sweeter style with Hannon's breakdown coming out of the blue. He mumbles away each day's proceedings until Thursday and breakdown comes signalling a darker hue to the rest of the album. Radiohead are again recalled on "Lost Property" which immediately follows "Note To Self", although saying that you could point that "Lost Property" has all the hallmarks of Divine Comedy's past: a quirky lyrical structure and a lush orchestration. Here, Hannon lists all those things he's lost over the years and in a dream at the songs conclusion he finds them and cries "tears of joy", although we know, like he does, that all the things we've accumulated and lost over the years will never be found again. A healthy disrespect for the establishment (particularly religion) and an almost Roger Waters-like fatherly guilt (Hannon's father was the Bishop of Clogher) is very much in evident throughout "Regeneration". In "Eye Of The Needle" and "Bad Ambassador" in particular Hannon questions his and others Faith in no uncertain terms. "Cars in the churchyard and shiny and German / distinctly at odds with the theme of the sermon" he sings in "Eye Of The Needle", an observation on where Faith is today, and the people that practise it. In "Bad Ambassador" he questions those preaching the Faith, those living ahead of their means while around them we live without the Jaguars and Japanese motorbikes. There are several other key moments when you realise that the lyrical cad of old has been replaced by a weary, almost depressed observer. Although saying that, Hannon still has a superb way with words and some of his trademark quips and songwriting prowess shine like beacons amid the darker moments of "Regeneration". Take "Perfect Lovesong" for example, a sure-fire contender for the next single (although they should release "Note To Self"). A cheeky play on the traditional love (pop) song that dominates the airwaves, it works a treat even with the opening request to "give me your love / and I'll give you the perfect lovesong / with a divine Beatles bassline and a big old Beach Boys sound". Recent single, the relatively downbeat but ultimately positive "Love What You Do" is another fine example. In "Dumb It Down" his darker lyrical skills are again to the front with "freedom wasted on the free" as the world gets dumber. In spirit "Dumb It Down" recalls Roger Waters superb "Amused To Death" solo album, with the world "lobotomised through sight and sound" where books are burned and the TV is king. In "Mastermind" "every pupil in the classroom will answer the same if you ask them" and Hannon questions what's "normal" and "sane". Around us, life has turned to greed and "every lung has a shadow on it and every heart comes apart at the seams" and it is a different world that Hannon now walks through. A different world than the one he inhabited when Divine Comedy were at their peak (after their breakthrough "Something For the Weekend" single and the rise of Britpop), but as he says you need a degree to see that something's wrong. Maybe here we see why Divine Comedy have "stripped down" from the musical majesty of old. Would anyone get it if they stayed the same? Do we need high quality when we have so much junk to contend with? Well, we need albums like this that's for sure. A wake up call of an album, "it has only just begun" Hannon promises on the title track, that is balanced, assured and maybe even a bit too conceptualised for some, but in the era of reality TV and "The Beauty Regime" ("take a look in the mirror and see, exactly how worthless you are") wake up calls don't get much better than this. A classic album from a now classic band and as changes in directions go, it's up there with the change in direction made by the Beatles with "Revolver" and Pink Floyd with "Meddle", greater things will surely arrive as a result of this album. "Regeneration" is sheer sonic bliss.